PREDATORS: A Fun Reunion At The Old Aliens’ Home – Schlockmania! The Predator films are a franchise that doesn’t have the greatest history. 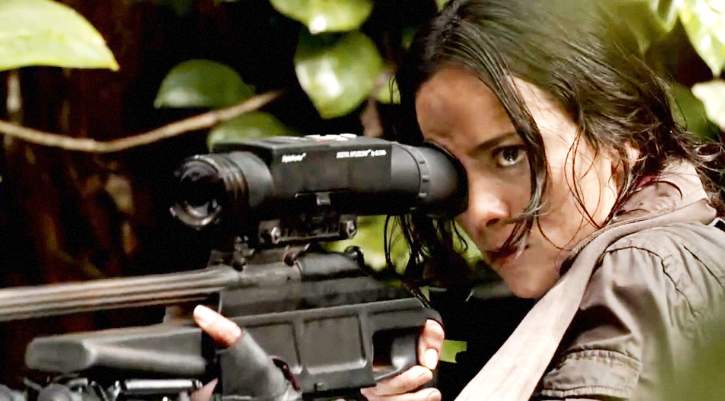 The first is a savvy action/sci-fi hybrid and a macho classic, to boot. A sequel followed a few years later: fans are divided over its merits but it did benefit from big budget resources that showed the studio was taking it seriously. 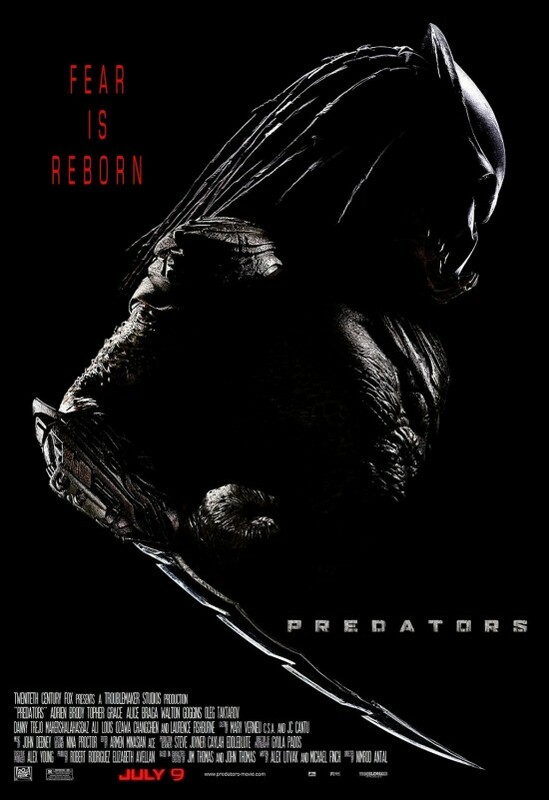 After Predator 2… a long period of inactivity on the big screen but it continued via comics in an Alien Vs. Predator series. When that crossover favorite finally made it to the big screen, the results were successful to inspire its own sequel but both films were typical modern genre-trash: loud, stupid and totally uninspired in every way. Over two decades later, Predator has finally gotten a proper third film in its franchise. 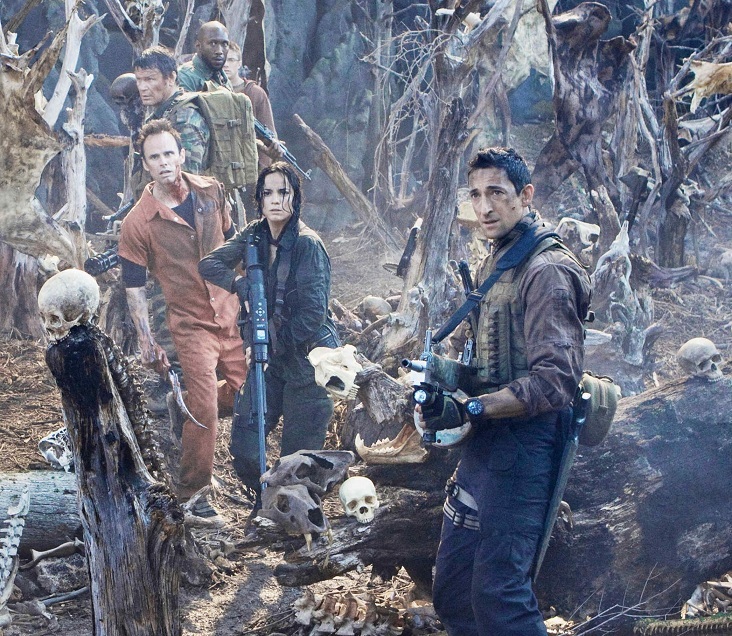 The filmmakers behind it wisely avoided resuming any past storylines, instead choosing to start fresh with a new group of characters being introduced to the Predator phenomena. The end result features a lot of familiar elements but negotiates them in a way that is more successful and satisfying than either of the Alien Vs. Predator fiascos. 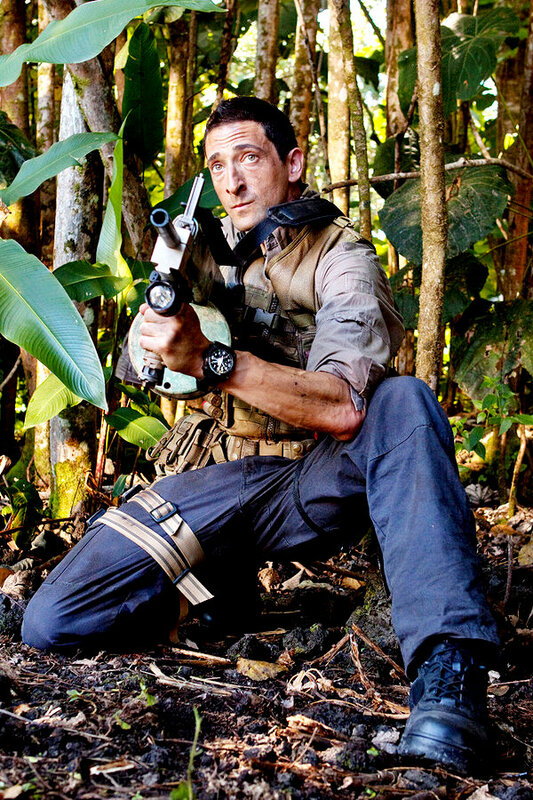 Predators opens in media res with Royce (Adrien Brody), our mysterious anti-hero, awakening from unconsciousness to find himself freefalling through the air. A parachute allows him to crash-land in the middle of an unknown tropical jungle, where he quickly meets up with a diverse group of characters, including a drug cartel enforcer (Danny Trejo), a silent yakuza (Louis Ozama Changchien) and a lovely but tough woman (Alice Braga) who happens to be an professional sniper. Each has weapons at their disposal but no guidance as to where they are or what they are supposed to do. Even worse, none of them know how or why they ended up there. Anyone familiar with the first Predator film won’t be surprised to discover that our thrown-together group of mystery heroes soon find themselves being hunted by crab-faced, rasta-dreaded aliens who have invisibility-cloaking devices and a fondness for bladed weaponry. However, there are some interesting twists and reveals and they are best experienced without prior knowledge so Your Humble Reviewer will refrain from additional synopsizing. Suffice to say, there’s plenty of humanoid vs. predator suspense, plentiful action and more than a little alien gore before it all winds down. The end results aren’t as great as the original Predator but then again, that’s not really a fair comparison. This is clearly a b-division production for the studio, farmed out to Robert Rodriguez for producing and done on a decent but not massive budget. On this studio-produced b-movie level, Predators fares well. The script does a solid job of revealing its story and characters in stages and the mystery-driven approach gives the material a real shot of life. The more action-oriented second half isn’t as interesting as the spooky first half but that’s inevitable with this sort of approach. Predators further benefits from committed work by a colorful and well-chosen cast. Brody does well cast against type as the tough-guy antihero and Braga adds a carefully-deployed emotional component to the film while living up to its action requirements. Changchien and Trejo add flavor to the supporting cast, as do Topher Grace as a doctor who seems sorely mismatched to this situation and Oleg Taktarov as a Russian soldier who may be the bravest of the bunch. Lawrence Fishburne also plays a role in the film (you can see him in the trailer) – opinions are divided on his work here but it’s best left to the audience to discover for themselves. Finally, the film is directed in a confident style by Nimrod Antal. This new-ish director delivered a tight, suspenseful thriller a few years back with Vacancy and he shows a similar sense of narrative economy here. His craft-conscious approach that Predators has a smooth pace and delivers admirably on both the action and suspense fronts. He doesn’t reinvent the wheel but his direction is confident and focused without relying on a bunch of fast editing or other postmodern trickery – and that means a lot these days.